Harsh Environment Hauling – Our heavy-duty vehicles are primed and ready for transport. We maintain a large fleet of road legal and oversize machines for supporting the fluid-handling side of drilling operations. Our equipment ranges from 130 to 325 barrel Vac trucks, Supersuckers, and Hurricane Vac units. These vehicles are winterized to operate in any weather condition. 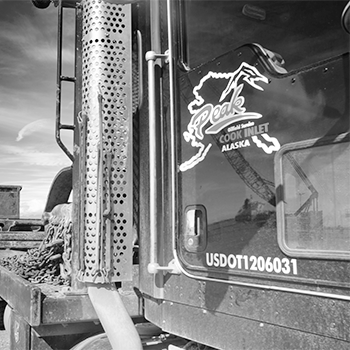 We’ve supported every operator in Alaska and work with our clients to develop cost-effective fluid handling solutions, from call out service to dedicated year-round support. Rig Moving and Logistical Support – Our specially designed Kenworth 849 SOW trucks can haul oversized rig modules of 1.8 million pounds or greater. We also have a fleet of bed trucks, winch trucks, and cranes capable of handling smaller, truckable rigs. Regardless of configuration, we can move your equipment – and we’ve got more experience with remote, arctic and subarctic locations than any other contractor. Whatever your needs are, from hauling rig mats, tanks, drilling tools, or other miscellaneous equipment, we’ve got the means necessary to drive it to and from your job site.